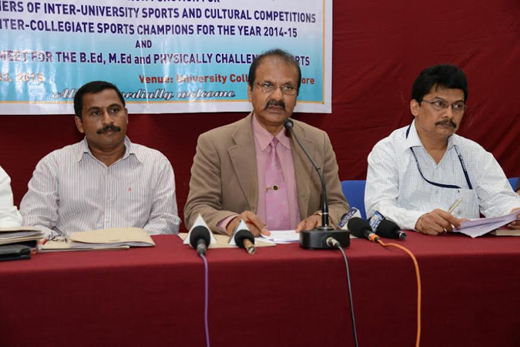 Mangaluru, Mar 20, 2015: Briefing media at University College March 19, Thursday, Mangalore University Vice Chancellor Prof K Byrappa stated, a revised sports policy will come into effect for the Mangalore University very soon. He informed that a 14-member committee with experts in the field has been formed for the same and the new policy will be ready within three to four months. University Physical Education Department In-charge Head Kishore Kumar C K said the existing sports policy was formulated in 1982 (when the university was established) and since then, there have been a lot of changes. Hence, there is a need for new sports policy. UGC grant : Informing that the UGC has sanctioned Rs 2.4 crore to the university considering the performance of the university, Prof Byrappa said the university plans to set up a fitness centre in the university. Besides, plans are also on the anvil to set up a physiology lab and to appoint a physiotherapist soon. He said the university has requested for Rs 25 crore grant to develop infrastructure in the university, especially construction of a stadium, with a 400 m track, and a swimming pool of international standard. The vice chancellor also announced that from this year onwards, the university will reserve one seat in each department exclusively for sports quota. Hitherto, one seat was reserved for NCC/ NSS/ Scouts/ Sports and Cultural activities. Listing medalists who had brought a good reputation to the university, Prof Byrappa said that this year the athletes from the university have won 10 gold, 11 silver and 9 bronze medals in the national-level inter-university sports meet. In addition, a student won bronze medal in the men’s category of cross country in the national-level inter-university meet, for the first time in the history of Mangalore university. The other big achievements made by university students include - bronze medal in women’s kho-kho, gold in hockey and fourth place in cricket in south zone inter-university meet, gold in ball badminton in national-level meet. Students have also won medals in kusti, power lifting, weight lifting, body building and athletics. The medalists will be honoured on March 25 at Mangalagangothri at a grand programme. While the gold medalists will be given a certificate with Rs 25,000 in cash, the silver and bronze medal winners will be felicitated with a certificate and Rs 15,000 and Rs 10,000 in cash and a trophy. While SDM College (Ujire) Principal Prof B Yashoverma will be the chief guest, Olympian Sahana Kumari will be the guest of honour and VC Prof K Byrappa will preside over the programme. University Registrar Prof P S Yedapadithaya, Student Welfare Officer Prof P L Dharma, Publicity Convener Prof G P Shivram and University College in-charge Principal Sunanda were present.